Note: If you are on V 1.5.X and above the download link for the latest solution will appear on the Help & About section. 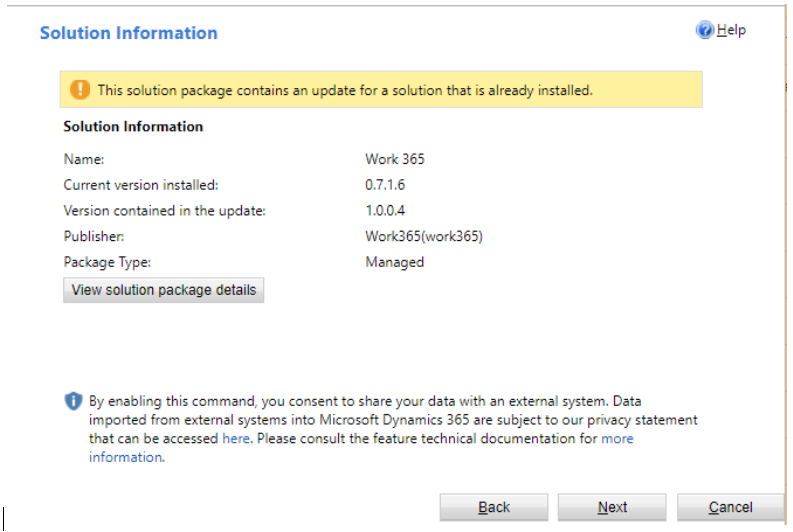 The following pre-requisites must be in place before the Work 365 setup can be initiated. This guide assumes that the reader has basic knowledge of CRM administration, including importing solutions. 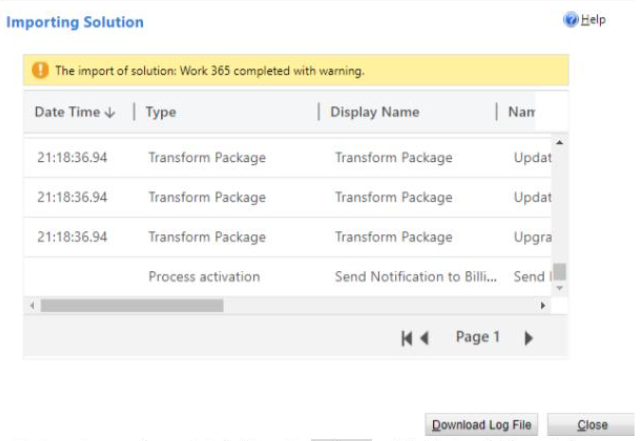 The user performing these actions should have the System Administrator role in Dynamics 365. The user performing these actions should be a Global Administrator on the Office 365 tenant associated with Dynamics 365. The Dynamics 365 tenant must have the Sales app installed. 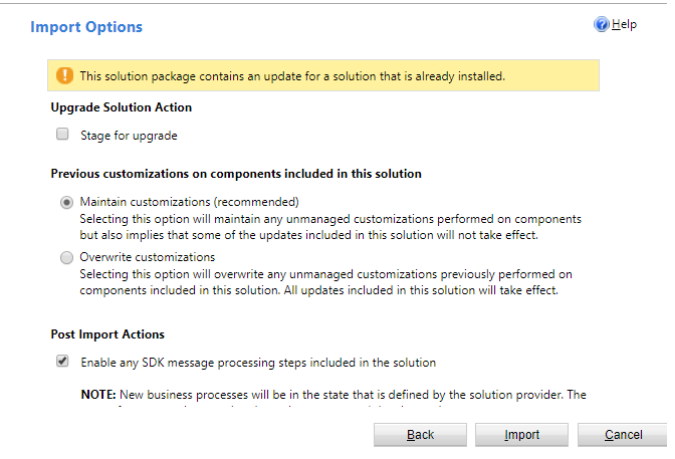 A service account should be created in Dynamics 365 with System Administrator privileges. The password setting can be configured as ‘Never Expires’ for convenience. Once the above pre-requisites are in place, the Work 365 module should be installed. 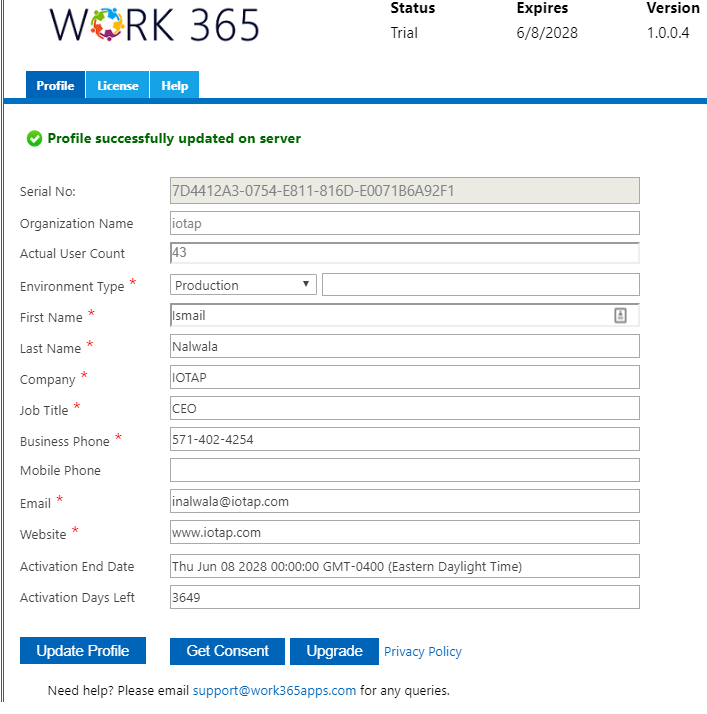 This creates the necessary CRM objects required to enable the Work 365 functionality. It is highly recommended to perform the below steps in an “InPrivate” or “Incognito” browser mode, created after closing ALL browser windows. You will see the registration page for the solution. Your profile will load on the form. NOTE: the Upgrade button does not change text and clicking it multiple times will not lead to errors. However, the button on the registration page will continue to show the upgrade button after the upgrade is completed. Upon completion, a success message will be displayed and the window can now be closed. Congratulations! 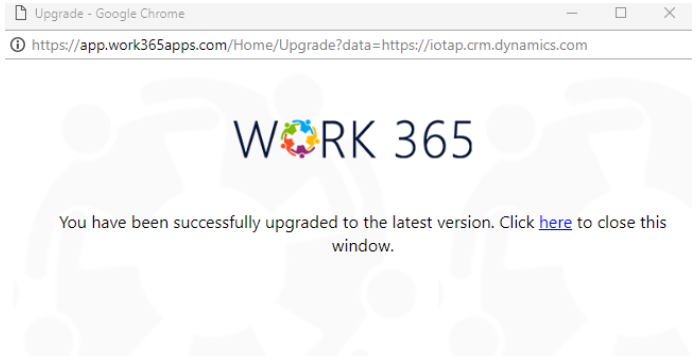 You have completed the upgrade process for Work 365.